Today I encountered a very pleasant 'crackme' challenge from Paweł Goleń. The purpose is to find out what is the purpose of demo page set up by Paweł. Not really readable... 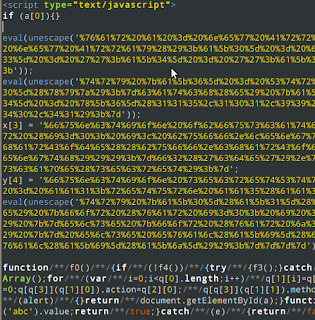 This code is obfuscated - modifed to make its analysis difficult. This is the technique widely used with malware software. Obfuscating code sometimes prevents the software from being detected by antivirus/malware scans, but it is mainly used to make it harder to determine what the script actually does (and e.g. prepare antivirus signature for it). With this code you may start decoding the script, consistently replacing obfuscated code in HTML with decoded one coming from Firebug console. 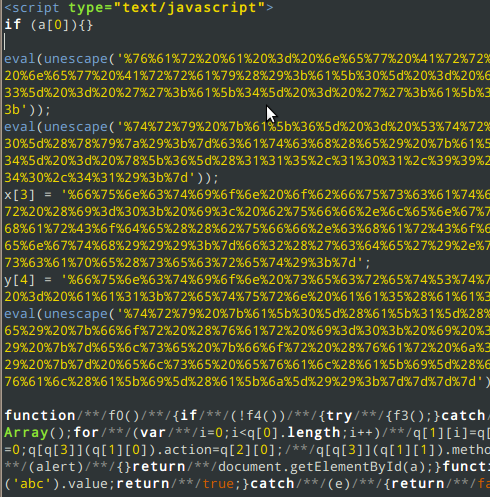 You can also insert the debugger; line anywhere in a JS to add a breakpoint. One thing to note - when debugging malware, be sure to make it in a safe environment (e.g. a separate virtual machine, some sort of sandbox), because otherwise there is a risk you'll become its victim.